Hollywood Boulevard is central to many tourist attractions, such as the Walk of Fame (stars on the sidewalk), the Chinese Theatre (handprints and footprints in the cement courtyard), Hollywood & Highland entertainment center and other popular attractions. Many of the guided tours depart directly from Hollywood Boulevard. This area spans along Hollywood Boulevard between La Brea Boulevard and Vine Street, with many attractions centered near Highland Avenue. The hotels nearest Hollywood and Highland are most convenient but can also be the most costly, although you can find an affordable room within a 5 to 10-minute walking distance. SPOILER ALERT: The two best hotels on this page are Loews Hollywood at Hollywood & Highland Center, and The W Hollywood near Hollywood and Vine. 1755 North Highland Ave. Loews Hollywood is a four-star luxury hotel, directly adjacent to Hollywood and Highland entertainment complex and the Dolby Theatre. The Hollywood Walk of Fame, Chinese Theatre, and Hollywood Boulevard attractions such as Madame Tussaud's are within minutes walking distance, and the StarLine Tour main terminal is just steps away. The Metro Red Line subway terminal is just outside the entrance of Hollywood and Highland, giving you easy access to Universal Studios and tourist attractions in downtown Los Angeles. 7000 Hollywood Blvd. There is quite a bit of history in this hotel, which makes this hotel as interesting as it is elegant. The Roosevelt is somewhat of an attraction of its own, and is about a 2-minute walk from the Red Line terminal. When you stay at Hollywood Roosevelt Hotel, you will not feel like this is a street in your home town. You'll *know* you're on vacation when you walk out into the glitz and glamor of Hollywood Boulevard! It will add quite a bit of entertainment value to your vacation when you can walk out the front door of your hotel and find yourself in the middle of a tourist attraction! 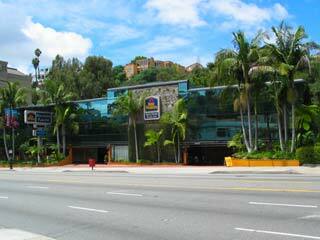 The Roosevelt is at the intersection of Hollywood Boulevard and North Orange Drive, across the street from Madame Tussaud's showcase of wax celebrities. You can cross Hollywood Boulevard at Orange, where you can visit Madame Tussaud's, the Chinese Theatre, the Dolby Theatre, Hollywood & Highland entertainment complex, and the Metro Red Line station. Many other attractions are nearby. This section of Hollywood Boulevard is usually active with tourists until at least midnight, so you will have plenty of time to enjoy it all! Hotels on Highland Avenue: This area is a 5 to 10-minute walk from Hollywood and Highland and within 10 minutes walking distance from the Hollywood Bowl. These hotels are also a short walk from a Metro Local Line 156 bus stop, which will take you directly to the Universal Studios Metro station. There are three hotels in a row on the west side of Highland Avenue (Holiday Inn Express, Hilton Garden Inn and the Holiday Inn) - these hotels offer slightly easier access to the attractions because you will not need to cross Highland Avenue. 2005 North Highland Ave. Full-service 3-star hotel. This was formerly known as Hollywood Heights Hotel, but was renovated and renamed in early 2012. [5 to 10 minute walk to Hollywood/Highland; 10-minute walk to the Hollywood Bowl]. 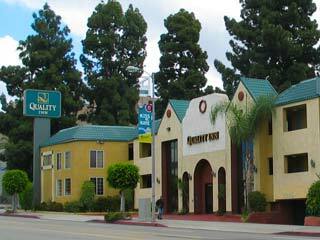 1921 North Highland Ave. A full-service 3-star hotel located a short walking distance to the tourist activities and Metro Red Line station. Across the street there is a bus stop for the Metro Local Line 156, which will get you to Universal Studios as quickly as the Red Line train. As soon as you exit the hotel you can see the arches of Hollywood & Highland. [5-minute walk to Hollywood/Highland; 10-minute walk to the Hollywood Bowl]. 2010 North Highland Ave. This hotel is on the east side of Highland Avenue, so you will need to cross it to get to the attractions. However the rates are lower so it might be worth it! The hotel is directly across the street from the Best Western. [10 minute walk to Hollywood/Highland; 10-minute walk to the Hollywood Bowl]. 2011 North Highland Ave. Just a short walk from the main tourist area, yet this hotel is a bit more secluded than the others. The rooms are set back from Highland Avenue and there is a large facade along the street that helps eliminate noise from the vehicles. It's not the most modern hotel in Hollywood although it is well-kept. [10 minute walk to Hollywood/Highland; 10-minute walk to the Hollywood Bowl]. Sunset Blvd from Highland Ave. to La Brea Blvd: This area is a 5 to 10-minute walk from Hollywood and Highland. You can get to the Sunset Strip in about 10 minutes using the Metro Local #2 bus on Sunset Boulevard. 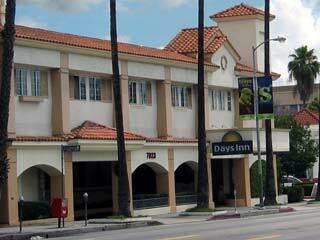 Days Inn Hollywood Near Universal Studios ($$) Great Value! Convenient Location! 7023 Sunset Blvd. This is a nice hotel for the price, and the location is convenient to some Hollywood Boulevard attractions, even though it's on Sunset Boulevard. You can walk up Orange Drive to go straight to Hollywood Boulevard, passing the Hollywood Roosevelt along the way (the Roosevelt is at the intersection of Hollywood Boulevard and Orange Drive). Madame Tussaud's, the Chinese Theatre, the Dolby Theatre and other attractions on Hollywood Boulevard are only a 5-minute walk from the Days Inn. Hollywood & Highland, and the Metro Red Line station are just a few steps further. You can take Metro Local Line 2 to the Sunset Strip (the bus stop is only steps away on the corner at Orange). It is less than a five-minute walk to La Brea Boulevard where you can take Metro Local Line 212 to Melrose Avenue. Nearby Restaurants: Days Inn Hollywood is adjacent to In N' Out, where you can get L.A.'s favorite hamburger! The hotel is also across the street from an IHOP (International House of Pancakes) restaurant where you can fill up on pancakes, waffles and all sorts of other yummy breakfast items (they are open 24/7). This is in addition to the many restaurants, cafes and snack shops you will find on Sunset Boulevard and also on Hollywood Boulevard. [5 to 10 minute walk to Hollywood/Highland; Internet Access; Complimentary Breakfast; Guided Tour Pickup]. 7051 Sunset Blvd. Easy walk to In N' Out and IHOP restaurants. [5 to 10 minute walk to Hollywood/Highland; Complimentary Internet Access; Complimentary Breakfast; Guided Tour Pickup]. 1520 North La Brea Ave. Large rooms with coffee makers, microwaves, refrigerators and cable television. This hotel is nicer than many of the others in the area with the same two-star rating, although it has the farthest walk to Hollywood & Highland. La Brea Boulevard is a good route to take to get to the I-10 freeway. 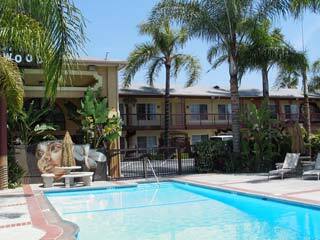 [10 minute walk to Hollywood/Highland; Free wireless Internet Access; Complimentary Breakfast; Guided Tour Pickup]. Near Franklin Avenue: This area is a 5 to 10-minute walk from Hollywood and Highland. These hotels offer unique alternatives to Hollywood Boulevard hotels. 1999 North Sycamore Ave. Spectacular views and luxury amenities at reasonable prices. This hotel is up the hill from the Magic Castle, and walking distance from Yamashiro restaurant, which offers Japanese and Asian-influenced cuisine. [10 minute walk to Hollywood/Highland]. Near Hollywood Blvd, between Highland Ave and Vine: This area is a 10-minute walk to Hollywood and Highland, or to Hollywood and Vine. 1738 North Whitley Ave. Complimentary Internet Access; Free local calls; Guided Tour Pickup. 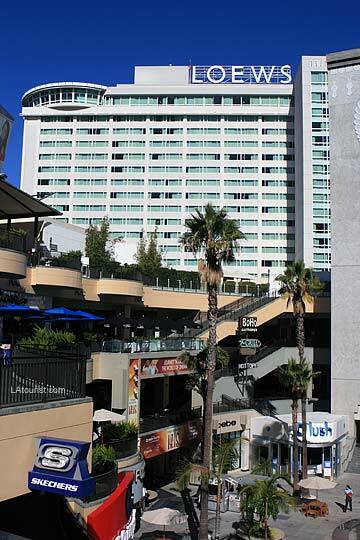 Hotels near Hollywood and Vine: This area is a 10 to 15-minute walk from Hollywood and Highland, or 5 minutes by train. There is a Metro Red Line station at Hollywood and Vine. 6250 Hollywood Blvd. A four-star full-service hi-rise hotel. The W hosts some of Hollywood's most exciting parties at it's rooftop bar. The hotel is across the street from the Pantages Theatre and near other attractions such as the Capitol Records building. W Hollywood offers an on-site restaurant that serves breakfast, brunch, lunch and dinner. The hotel is adjacent to the Hollywood/Vine station of the Metro Red Line train, offering easy access to attractions at Universal Studios, downtown L.A. and Hollywood & Highland. 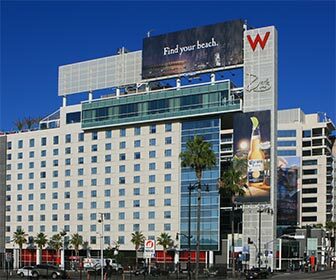 The Hollywood FlyAway shuttle stop (transportation to and from LAX airport) is adjacent to the W Hollywood, making this hotel a great choice for those who prefer not to drive everywhere. [MORE: 10 to 15 minute walk to Hollywood/Highland (or take the Red Line train); Internet Access; Complimentary Newspaper; Free Shuttle Service (Limited Service and Times); Guided Tour Pickup]. Lower Rates and Free Parking! 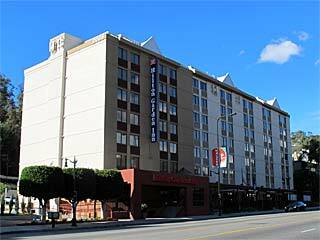 A list of hotels and motels that are in between Downtown Los Angeles and the Hollywood Boulevard Entertainment District, near MTA Metro Red Line train stations. The rates are lower here and you can easily take the Red Line train to Hollywood & Highland, Universal Studios, and downtown Los Angeles. Click here to see the list of hotels near MTA Metro Red Line train stations.